The King of Cheese, “Parmigiano Reggiano” 100% grated cheese. New packaging of small individual size pouches to eliminate the issue of caking up after opening. 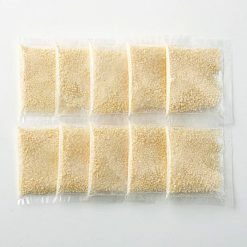 Aged for 24 months, grated Parmigiano Reggiano in small pouch packages for freshness. The reason why Parmigiano Reggiano is the “The King of Cheese”? Parmigiano Reggiano has been kept its high standard for its history of 2,000 years in Italy. Its quality is maintained by extremely strict supervision from the origin of raw milk, place of production, manufacturing methods are defined by Association of Accreditation and only products that pass their examination can become worthy of their offical engrave as the proof of certification. The servicing size is one bag per 1 serving of pasta (4g) as a general guideline. Parmigiano Reggiano has a distinct aroma and contains one of the highest level of glutamate, which is why it gives out so much Umami, the fifth sense of taste. 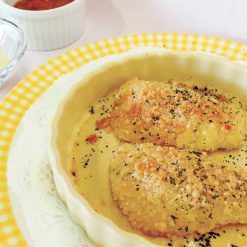 Great topping for pasta, gratin, pizza and salad. Enhances flavor when used for topping for soups and stews as well, and as a seasoning. Add Parmigiano Reggiano to a mixture of olive oil, vinegar, salt, pepper, lemon juice and a dash of basil and/or oregano, blend well to make fresh Italian salad dressing. (If the dressing is too strong, a tablesppon of water can be added. )It also can be used as an ingredient for the hamburger patty and meatballs for a nice favor. Use in bread dough along with some hebs, such as rosemary, basil, parsley for different flavored bread or rolls. This product contains natural cheese (raw milk, salt) (made in Italy). This product is not suitable for anyone with allergies to milk. The recommended shelf life for this product is 6 months.